The Western New York Land Conservancy has been leading efforts to restore and enhance the natural habitat on 33 acres of land along the gorge with funding from the New York Power Authority via the Niagara Greenway Commission Ecological Standing Committee. With the addition of Buffalo Billion Phase II funding, the Land Conservancy is able to remove invasive species and restore an additional 70 acres within the gorge and along the rim from Whirlpool State Park to Devil’s Hole State Park. This project will transform the ecological health of the Niagara River Gorge and Rim and enhance the visitors’ experience at Niagara Falls. As one of the most biologically diverse places on the Great Lakes, the Niagara Gorge is home to unique ecological communities including many rare plants, and is also part of a globally significant Important Bird Area. The lower Niagara River rapids are important spawning grounds for freshwater fish including threatened Lake Sturgeon. Unfortunately, the health of this sensitive environment has been harmed by many factors, especially non-native invasive plants. The Land Conservancy is hiring contractors to remove harmful invasive plants like common buckthorn, tree-of-heaven and phragmites, as well as replanting with beneficial natives like basswood trees, ninebark shrubs and red columbine. 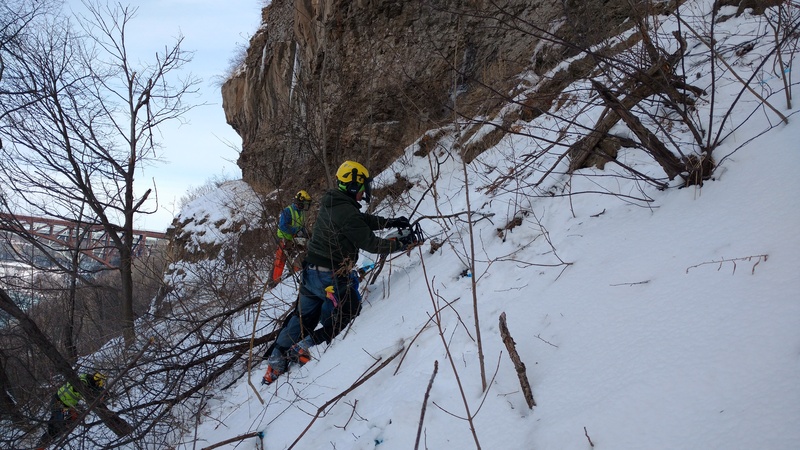 February 2018 - On-the-ground ecological restoration work to “Restore the Gorge” in Niagara Falls begins. This $2.1 million project will control invasive species and plant native trees, shrubs, grasses and flowers in the Niagara Gorge from the Niagara Gorge Discovery Center to Devil’s Hole State Park. It complements Governor Cuomo’s $70 million revitalization of Niagara Falls State Park and other strategic state investments to strengthen the tourism industry in downtown Niagara Falls. This project is supported by $1 million from Buffalo Billion Phase II, nearly $1 million from Niagara River Greenway Commission's Greenway Ecological Standing Committee and a $100,000 grant from Oath Community Benefit Fund for Niagara County by the Empire State Development. Learn more about the Western New York Land Conservancy here. Learn more about Restore the Gorge here.